George Everest joined the Royal Artillery in 1818. He was the assistant of William Lambton, who started the Great Trigonometrical Survey of India. After his death in 1823 Everest succeeded him and in 1830 he was appointed Surveyor-General of India. In 1843 he returned to the UK, where he became a fellow of the Royal Society. In 1857 he opposed the idea that the highest mountain in the world would be named after him. His objected because local people woudn't be able to pronounce the name Mount Everest, but it was named after him anyway. In 1861 he was knighted and in 1862 he became the vice-president of the Royal Geographical Society. He died in 1866. 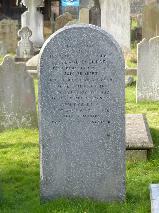 The grave of George Everest at St. Andrews Churchyard, Hove.